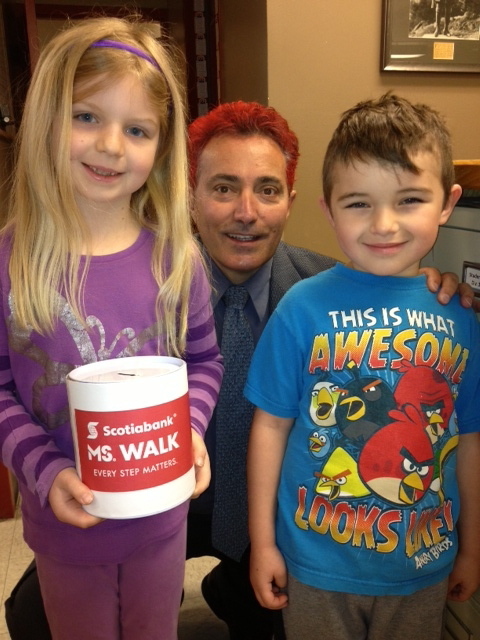 Vic West Elementary Parent Advisory Council: MS Walk fundraising success! Thank you to all Victoria West Elementary students, staff and families who came together to raise $200 for the Multiple Sclerosis Walk on Sunday, April 14th. Every contribution mattered. An extra special thank you to Eden Forbes who donated $55 of her birthday money to her friend and classmate, Cole Rant, who was raising money and doing the walk for his grandmother, Barri Ann, who was a former student of Vic West and whose journey with MS sadly came to an end this past February. And who's that with the pink hair?! A big shout out to school principal, Mr. Cardle, who kept his word and dyed his hair a lovely shade of pink to celebrate reaching the fundraising goal. The promise was a great motivator for the students to get those loonies and toonies donated.